This is part two of two OTSG Firsts submitted by Dee S. You can see her first entry here. 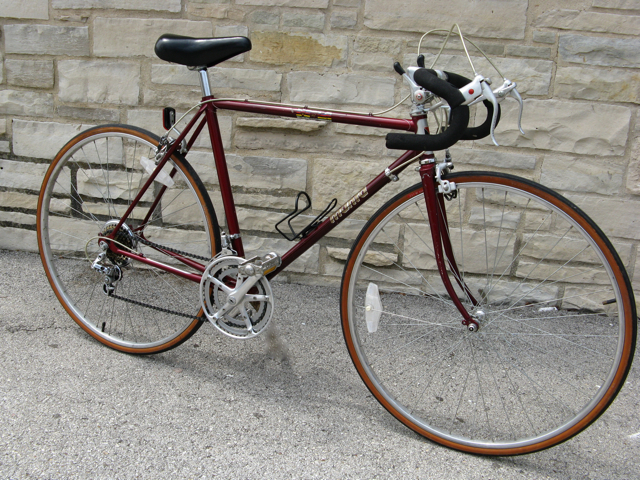 This time around, it’s very nice looking 1984 Manta 10-Speed. There isn’t much out there on Manta, but there is a conversation starting bicycle saddle of the same name. I’m not sure if there’s a model name, as the decal was too scraped up to read. The Giant serial number on the right drop out dates this one to 1984. It was a little more scuffed up than the Chimo, but all it needed was cleaning. It has a chromoly frame, with AR derailleurs and alloy wheels. I love that you can pick up a 25 – 30 year old ten speed and more often than not all it takes is some air in the tires and a little tinkering and it’s ready to hit the road. That’s simple, well designed technology. Hold on a minute! I’ve been in blackout for two days and you slipped not one but two schwinns past me! I was busy creating my art over at fat cyclist…always exhausting…nice Manta, whatever that is, but more schwinns! More Schwinns!! I have a very similar manta, but it is a blue frame with Bronze trim and pinstriping. Great bike. There is NO information out there on these bikes! Mine has since been re-purposed into a fixed gear commuter. I just bought a Manta 12-speed and I cannot find much info out there about it. I live in Wisconsin, and it seems many Manta owners also do. I wish I could find more history about this company.